Glowering amid dark rumours and terrible stories of desperate adventure, death, betrayal and glimmering treasures squat the unutterably ancient halls of Gloamhold. This crumbling, benighted, haunted dungeon complex of unknown, but undeniably vast, extent is buried deep within the grim and brooding spray-drenched headland of the Mottled Spire. It is a place of legends, madness and death. Even reaching Gloamhold is difficult. By land, adventurers must negotiate miles of trackless, jagged crags and sullen, dark gorges, chasms and valleys. Those approaching by sea have it no better. They must brave over a mile of savage, foam-flecked waves. Tides about the headland are notoriously treacherous; wrecks of ships large and small driven to destruction litter the seabed. Winter storms render Gloamhold all but inaccessible by sea for several months every year. A harsh chunk of limestone rearing hundreds of feet into the perpetually cloudy sky the Mottled Spire looms over the turbulent waters of Hard Bay like a malevolent giant. The several attempts to colonise the barren headland all ended in failure and death. Surrounded by crumbled outbuildings, a now ruined lighthouse – now colloquially known as simply “The Shard” – stands atop the promontory’s highest, most wind lashed bluff. Elsewhere, on the spire’s landward side, languish the weed choked, tumbled ruins of Greystone – a fortified village abandoned decades ago. Occasionally, redoubtable bands of adventurers poke around both sets of ruins. Some return, while others simply disappear – perhaps finding certain secret connections rumoured to lead into the upper levels of Rivengate and from thence deeper into Gloamhold’s lightless depths. An insidious curse lurks within Gloamhold. Those exploring the place can fall foul to the so-called Gloamhold Look. Although much of Gloamhold remains unknown – nothing more than the subject of wild whispers and rumours – knowledge of a few locations has come to light through the explorations of brave (or foolhardy) adventurers. Rivengate: Of dark and forbidding aspect the lower portions of the once mighty Rivengate collapsed into the sea long ago. Built by unknown hands to protect Gloamhold’s approaches remnants of the citadel yet cling to the upper cliffs. The Splintered Stair links Rivengate to the cellars buried below the Shard. The Murkwater: Only skilled or lucky captains dare to sail into the gloom of Rivengate’s gaping maw. Within flows the dark and treacherous Murkwater; the seething, foam-flecked waters below Rivengate are particularly hazardous with jagged rocks fallen from above, savage rip tides and more lurking to catch the unwary or the unlucky. The Twisted Warrens: Honeycombing the rock above the Murkwater, the Twisted Warrens are a confused and convoluted network of (mostly) natural caverns and passageways inhabited by derro, troglodytes, dark creepers and worse. The Breathless Narrows: A network of flooded, fractured caverns radiate outwards from beneath the Murkwater. The water therein is only fractionally above freezing and explorers need magic to survive for any length of time in this airless, lightless world. 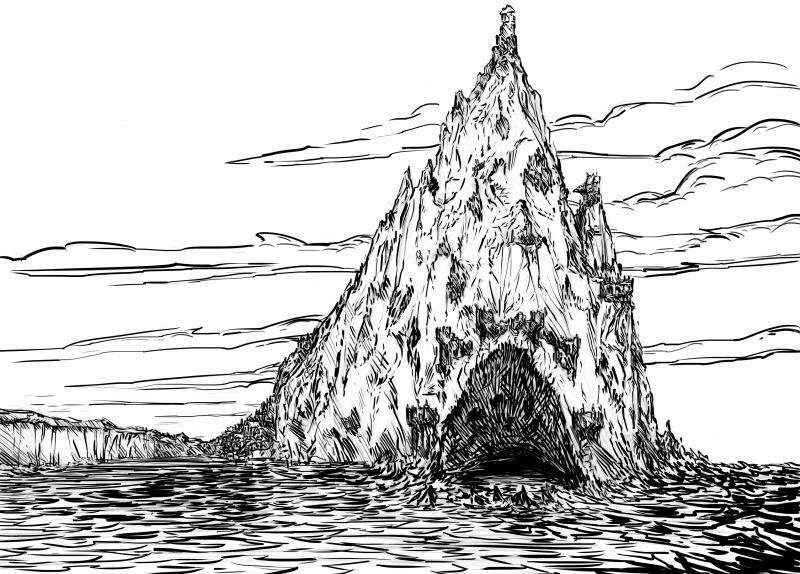 The Twilight City: Buried in an immense cavern at the very heart of the Mottled Spire, the Twilight City sprawls across a series of low islands struggling above the cold, dark waters of the Sunless Lake. An ancient place of stone ziggurats, fetid and twisted canals and cyclopean architecture, troglodytes built the city when the world was young and their great empire straddled much of the known world. The Ebon Road: Adventurers travelling the Ebon Road enter the largest dungeon of them all: the Ebon Realm. Few return. Greystone (Ruined Village): The creeping tendrils of human civilisation did not linger long on the Mottled Spire’s rocky slopes. A nameless aura of fear and decay smothers these crumbling, wind-blasted ruins. Persistent rumours of the inbred descendants of the original inhabitants lingering in the ruins are commonly held as truth among Languard’s populace. The Shard (Ruined Lighthouse): Destroyed decades ago at the height of a particularly vicious and prolonged storm of unnatural virility, the Shard juts from the Mottled Spire like a jagged, broken tooth. Occasionally, faint lights are glimpsed in its vicinity and during particularly savage storms the translucent image of a ghost tower can be seen rising from the Shard’s shattered stump. Languard (Large Town): Heavily fortified, Languard dominates the narrow strait separating Hard Bay from the open sea. Built over a series of rocky bluffs a stout stone curtain wall encircles the entire town and a rocky breakwater protects its harbour. Those choosing to dare Gloamhold’s depths often start their journey in Languard. Wellswood (Village): A busy, bustling place, Wellswood stands at the juncture of two trade routes. The village’s most notable feature–a subterranean lake–lies beneath the village itself and here the villagers fish its depths for the exotic fish living therein. I’ll be live-designing Gloamhold over the coming months (and possibly years — who knows) here on my blog. This page will update every week with new links to the various facets and parts of the megadungeon along with some locations in the surrounding area. For over a year, I’ve been giving serious thought to designing a megadungeon of my own. I love the idea of adventuring in a megadungeon and Gloamhold is my attempt to design such a locale. Of course, I’m not going to try and design the entire thing – such an undertaking would be madness. In any event, I’m firmly of the opinion a designer should not set in stone (as it were) every nook and cranny of a megadungeon. Part of the joy of such locations is that individual GMs can customise and tweak the complex to better suit their own campaigns. Gloamhold Design Tenets: I’ve previously blogged about megadungeon design. The thoughts in that post form the bedrock of my design philosophy for Gloamhold. Additionally, here I talk about how much detail is too much in megadungeon design. Slow Advancement: Gloamhold’s design assumes the use of the slow advancement track. I’ve previously blogged about the slow advancement track and why I love it, and how I use it. I’ll be elaborating on why I’m using the slow advancement track in a future blog post. 95% Core: As you read through Gloamhold, you’ll discover the vast majority of the material within comes from the Pathfinder Roleplaying Game Core Rulebook. That’s a deliberate design decision on my part, as I describe in this post. Down with the 15 Minute Adventuring Day! : I loath the concept of the 15 minute adventuring day. Thus, I’ll be actively taking steps to promote longer explorations. I elaborate on this concept here. The Illusion of Detail: It’s impossible to comprehensively design a dungeon the size of Gloamhold. In places, the GM will have to create the illusion of detail through clever preparation. I’ll enable the GM to do this via some cleverly designed area generation tables, which I talk a little bit about here. Feel & the Challenge of it All: In this post, I talk a little bit about the feel of the dungeon and how its design is more challenging than I could have imagined! How to Make An Old School Character Using the Pathfinder Roleplaying Game (This is my first stab at Gloamhold-specific character generation guidelines). The Gloamhold Campaign Guide is now available from Raging Swan Press. You can check out more details at Raging Swan’s website or head over to Raging Swan’s webstore to snag a copy. Can yoiu publish this as a pDF? I will be publishing Gloamhold (hopefully) through Raging Swan Press but that won’t be for some time. There’s a lot to design. Alternatively, did you just mean this page? This is impressive. I love old school dungeons and quality module work – this seems to have both. I’ve been sadly disappointed with how modules and game aids have become scaled down and thinned out when compared to some of the old school sets like Dragon Mountain for 2E and all of the Middle Earth Roleplaying products. Not only will I be watching this develop, but would love to be a part of its creation. Would you be interested in hiring a writer, pro bono? I would love to work on some small part of this project, and I have no expectation of payment. It would just be something cool and fun to sink my teeth into. Thanks for the kind words, Darvin. At the moment, I’m not looking for co-authors, although I will be at some point in the future. Gloamhold is too big for any one person to detail. 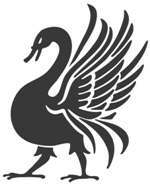 That said, I am looking for authors for general blog posts for raging swan.com. If you are interested, I’d happily shoot you a contract and a design brief. Incredible. Your words, your style, your adherence to the most classic, old-school feeling of D&D – everything about this website is awesome. Gloamhold seems a truly nightmarish place and I look forward to reading more about it. Even if I’m not a big fan of megadungeons, the way you go about this project is very inspiring. Do you have any sketches of the layout or preliminary maps that you can show, or do you want to keep these strictly for the published PDF? Thanks very much for your kind words, Vincent! I’m probably going to post a very basic overview map of the levels I’ve thus far mentioned next week, as I’ve been thinking for some time I need to do so. Sadly, my mapping skills are terrible, but hopefully it should give you a basic idea of how things tie together. I’ll definitely be on board for a print product.